Who invented Barbed Wire? The name of the person credited with inventing Barbed Wire is Joseph Glidden (1813 - 1906). Joseph Glidden is not only famous as the American inventor of Barbed Wire but also as a school teacher, farmer and businessman. When was Barbed Wire invented? Joseph Glidden invented Barbed Wire in 1873, during the Second US Industrial Revolution / Victorian period of invention (1850 - 1914). Definition of Barbed Wire: Barbed Wire is defined as a strong, twisted form of wire fencing constructed with sharp edges and points, or barbs, at regular intervals that was originally used to prevent passage of cattle. Fact 1: Who invented Barbed Wire? Barbed Wire was invented by Joseph Glidden in 1873 during the Second US Industrial Revolution era of inventions (1850 - 1914) which was a tremendous addition to advancements made in the area of Agriculture. Fact 2: Who invented Barbed Wire? The invention of Barbed Wire in 1873 made a significant contribution to the Westward Expansion program of the United States of America. As the frontier moved further westward into the Great Plains the traditional fence materials of wooden rails and stone became scarce and more expensive. Fact 3: Who invented Barbed Wire? The lands became an "Open Range" as there were no fences and cattle roamed free, moving between grazing lands. Fact 4: Who invented Barbed Wire? The inventor of Barbed Wire, Joseph Glidden, was born on January 18, 1813 in Charlestown, New Hampshire, United States and died on October 9, 1906. Fact 5: Who invented Barbed Wire? The early years of Joseph Glidden were spent in Charlestown, New Hampshire, United States where he was raised by his family. 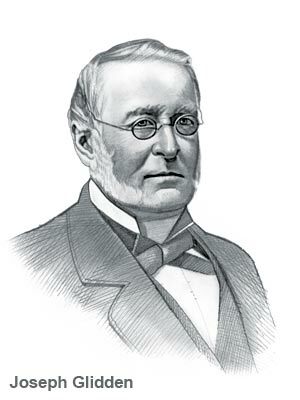 Joseph Glidden was well educated at Vermont's Middlebury Academy and a seminary at Lima, New York. He began his life as a school teacher. Fact 6: Who invented Barbed Wire? Joseph Glidden married Clarissa Foster in 1837 and he purchased a small farm in Illinois. His wife Clarissa and his children all sadly died. Fact 7: Who invented Barbed Wire? Joseph Glidden enjoyed working on his farm and by 1844 had earned enough money to purchase 600 acres of land near the Illinois town of DeKalb. He built a house on the farm and began raising cattle. Fact 8: Who invented Barbed Wire? In 1851 Joseph Glidden married Lucinda Warner settling into a life as a farmer . Joseph Glidden was a respected member of the community and held various county government positions in addition to working on his farm. Fact 9: Who invented Barbed Wire? Joseph Glidden began searching for a better fencing method after his wife, Lucinda, complained about livestock continuously getting into the yard. Fact 10: Who invented Barbed Wire? The invention of Barbed Wire began when Joseph Glidden attended the 1873 Dekalb, Illinois county fair. As he wandered around he was attracted to a demonstration of new wooden fence rail that had been patented by Henry M. Rose. It was a wooden rail with sharp nails protruding along its sides, that hung inside a smooth wire fence. The fence rail was designed to be attached to an existing fence to keep cattle and other livestock from breaking through. Fact 11: Who invented Barbed Wire? Joseph Glidden went back to his farm and began to think about how the sharp nails deterred the cattle and what he could do to emulate the effect. Fact 12: Who invented Barbed Wire? One of the great inventions of the Industrial Revolution was the Bessemer Process that was invented by Henry Bessemer in 1855 which produced steel cheaply and efficiently. This resulted in the United States moving from iron into the Age of Steel. Fact 13: Who invented Barbed Wire? The invention of Barbed Wire was prompted when Joseph Glidden began twisting his wife's hairpins and he began working on the idea of a wire fence. Metal was not used for fencing until steel wire became cheaply available due to the invention of the Bessemer Process. Fact 14: Who invented Barbed Wire? Joseph Glidden began to experiment with make steel points, or barbs, using an old coffee bean grinder as an improvised tool. He began placing the barbs at different intervals along a smooth wire, and then twisted another wire around the first to hold the barbs in place. Fact 14: Who invented Barbed Wire? He manufactured his barbed wire fencing by hand sectioned his farm with his new fencing. His neighbors were impressed with his invention and began asking him to make them the same type of fencing. Fact 15: Who invented Barbed Wire? Joseph Glidden patented his Barbed Wire on May 12, 1874. A previous patent was filed by Michael Kelly who had patented a barbed wire for fencing on November 17, 1868, which was reissued April 4, 1876. However Kelly's idea was different, consisting of a flat wire, with the barbs inserted in holes made through it. Fact 16: Who invented Barbed Wire? In July 1874, Joseph Glidden entered into partnership with Isaac L. Ellwood, and commenced manufacturing in the City of DeKalb. Demand for the Barbed wire fencing was so great that in 1875 they moved to a larger building. Fact 17: Who invented Barbed Wire? Glidden became involved in a three year legal battle but was eventually declared the rightful inventor of barbed wire. Fact 18: Who invented Barbed Wire? In 1876, Joseph Glidden sold his half of the patent to Washburn & Moen Manufacturing Company for $60,000 plus royalties. The deal would make him one of the most richest men in the United States. Fact 19: Who invented Barbed Wire? Joseph Glidden went on to buy a newspaper, a hotel and a bank together with 250,000 acre ranch in Texas. Fact 19: Who invented Barbed Wire? Joseph Glidden died on October 9, 1906 in Clarendon, New York. Fact 20 - Impact: How did Barbed Wire impact the world? The impact of the invention of Barbed Wire was a major step to improving the field of Agriculture. The invention of Barbed wire fencing changed farming and ranching methods and contributed to the end of the Wild West Cowboys of the Old West. Now you know that Joseph Glidden was the person who invented Barbed Wire! We hope that the facts in this article have provided the answers to all of your questions about the invention of Barbed Wire and its famous inventor, Joseph Glidden.